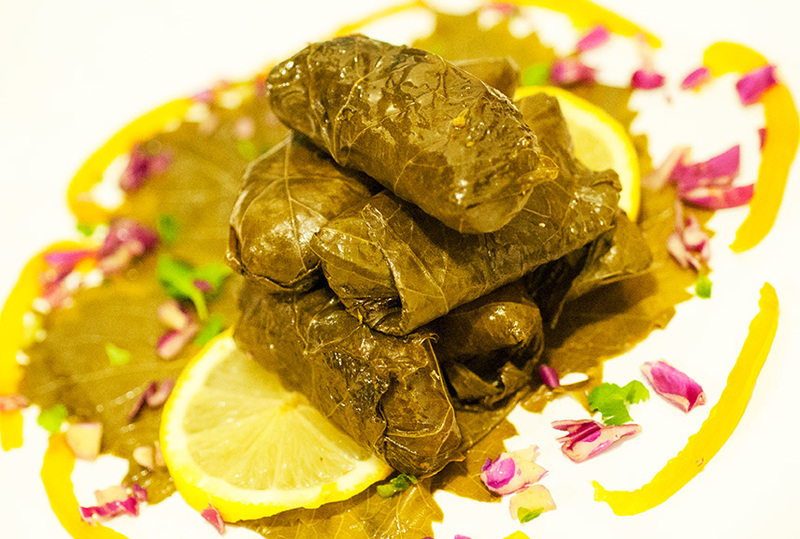 Please vine leaves in a large bowl and cover with boiling water for approximately 10 minutes. Drain the leaves and place on top of a wad of paper towels to soak up excess water. Place on work surface or cutting board. Finely chop the herbs. Pulse the onions and tomatoes in a food processor or blender, then mix with herbs in a medium bowl. Add the rice, corn oil, sea salt, cumin, fenugreek, black pepper and cayenne pepper to the bowl, mixing evenly. Line the inside bottom of a heavy Dutch pot with vine leaves. This helps keeps the leaves from direct heat and burning. It also provide an extra layer of flavor in the steaming process. Take one leaf vein side up and place on work surface, place approximately 1 tablespoon of rice mixture across the width of the leaf. Gently and loosely roll the leaf up aound the rice tucking in the sides as you roll up. Complete by finishing the roll and placing it on seam to help stay closed. Finish the rest in like manner. When complete, place the stuffed leaves concentrically in the pot, snuggled closely and seam facing downwards. You may stack up for a second layer. Place lemon slices on top of leaves and place a full size circular plate upside down on top of vine leaves to keep them from floating. Think of this method like makeshift pressure cooking, providing a more intimate steaming environment for a more tender bite. Let simmer on low for approximately 60-90 minutes. Keep an eye on the pot every 30 minutes or so to make sure the water has not dried out. 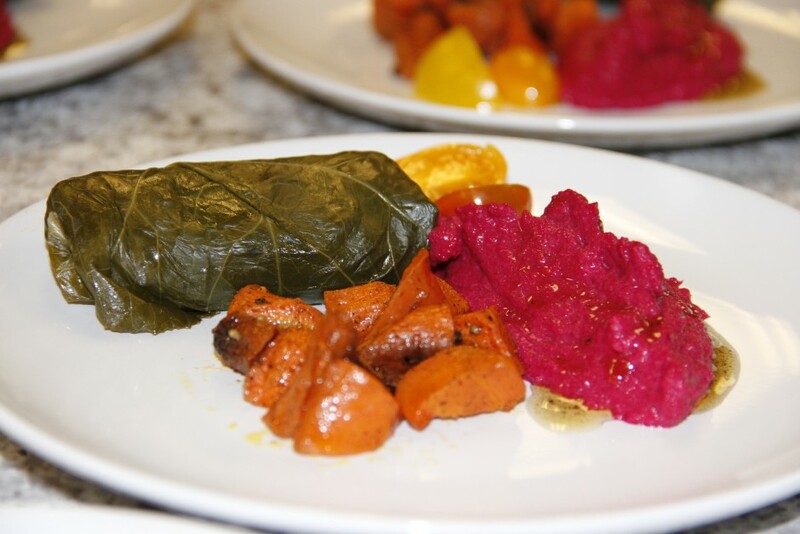 To test for doneness, break a stuffed vine leaf in half and taste. Serve warm or room temperature. Enjoy! *Fenugreek is not typically found in powder form. Get the seeds whole and grind in a coffee grinder. Seeds can be purchased at specialty stores such as Kalustyans.